Everyone in our family knows I love Indian food. Unfortunately, not everyone feels the same way as I do. Roy, Caroline, and her boyfriend Adam lobby against it. I have converted Jenn, but it's not her favorite. Only Allison likes it as much as I do, and she's not even in the same country right now. So I have to get my fix at lunch time when I whip up something for myself. If I have fresh cauliflower around, aloo gobi is a quick way to satisfy my craving. I should just call it gobi, because I leave out the aloo (potatoes). This version is heavily influenced by the Jamie Oliver way of making curries since it contains coconut milk as an ingredient. It's an interesting side or cooked and chopped chicken could be added to make it a main entree. It is also a great "Meatless Monday" dish as well. Wash, core, and cut the cauliflower up into florets. Peel and dice the onion. Use a vegetable peeler to get the skin off the ginger and finely dice it. Remove the seeds and membranes from the jalapeno pepper and dice it up. Use only half of the pepper if less spiciness is desired. Set aside two tablespoons of cilantro leaves, then chop the rest of it up, stems and all. Heat the oil up over medium low heat in a pan and add the onion, ginger, pepper, and chopped cilantro. Cook for about 5 to 7 minutes or until the onions are soft and tender. Then add the cauliflower florets, mustard seeds, cumin, turmeric, salt, and pepper. Mix well and continue to cook for another minute. Add the coconut milk and stir to combine. Bring everything up to a boil, then turn the heat down to low and let the mixture simmer for about 15 to 20 minutes or until the cauliflower is tender and you can stick a fork into it easily. Sprinkle the reserved two tablespoons of cilantro leaves over the top and serve with rice and/or naan bread. Around our house the acronym "OPR" means Other People's Recipes. This little term came about after Jenn and I spent a frantic day last November making and photographing eleven recipes. I had come up with the idea of doing an article featuring the favorite holiday recipes from the writers who contributed to the community magazine I write for. The deadline for the piece was several days away, but it fell right when Jenn and I were to be driving her car across the country to move her to California. So, the two of us had a wild time using just about every measuring spoon and baking dish in the house while depleting all of our baking supplies. The results were interesting; some of the dishes were delicious and some were a little different than our palates were used to. The main thing I realized though, was that each recipe had a memory behind it which made it special to the person that submitted it. We had a great time that day and I wouldn't trade that memory for anything! For the sake of curiosity, click HERE for the online version of the resulting article - although unfortunately it seems that the photos didn't make the transfer. 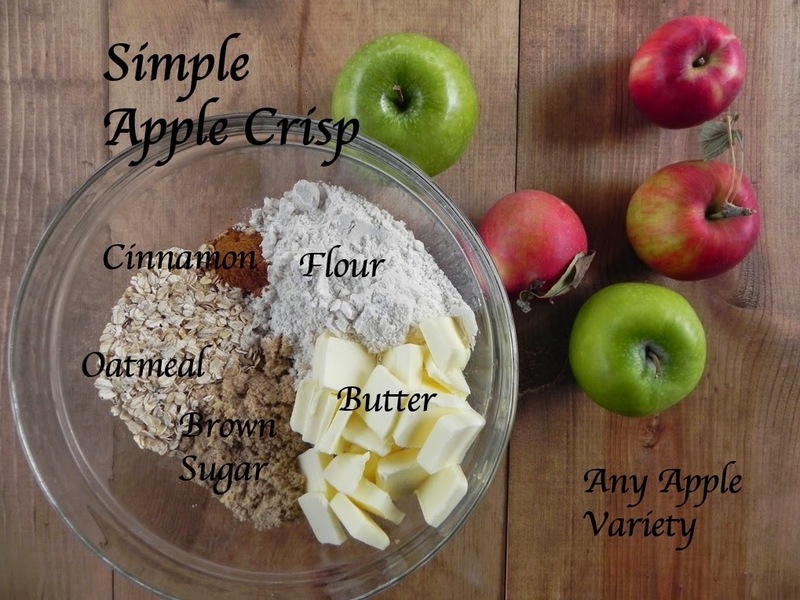 The apple crisp recipe posted here happens to be an OPR as well. It belongs to my friend Dory and it's one of the easiest yet yummiest versions I'd ever had. It's an OPR to keep! I use an apple peeler to cut away the skin of the apples. Then I quarter them, cut out the core, slice them up, and place them in a baking dish. My favorites to use are Granny Smith, but I also like Jonathan. If I am using a sweeter apple such as a Fuji, I mix one tablespoon of water with one tablespoon of lemon juice and sprinkle the mixture over the apple slices. While the oven is preheating to 373 degrees, mix together the brown sugar, oatmeal, flour, butter, and cinnamon until crumbly. Spoon evenly over the apples in the baking dish. Place in the oven and bake for 35 minutes or until it is brown and bubbly. This is especially good served with vanilla ice cream or even just a drizzle of heavy cream. Autumn Veggie Question: Salad or Bowl? Or... Copy Cat Version of Starbuck's Hearty Veggie and Brown Rice Salad Bowl? I can't help but jump on the fall band wagon with these two autumn veggie dishes. The colors of the vegetables are exactly what I see outside: white frost on the ground, orange pumpkins on porches, and purple chrysanthemums in pots. The flavors are heartier than lighter summer salad stuff and with chilly mornings and nights, they are what I'm craving right now. A few weeks ago I met a friend at Starbucks to chat. I had been busy all morning and hadn't eaten yet so I took a chance and got their Hearty Veggie & Brown Rice Salad Bowl. It was so yummy that I've been making excuses to have it for lunch ever since. I figured I'd better find a way to duplicate its Lemon Tahini dressing at home, or I was going to bust my lunch budget before the end of the month. I think I've gotten pretty close and the result is posted below. Also posted is another of my current salad obsessions, a kale Brussels sprout salad with a great Dijon vinaigrette. However, any of the veggies listed below could be combined together and either of the two dressings posted below could be used. The possibilities are endless and delicious! To make enough for four servings use two bunches of kale, one medium butternut squash, 1 pound Brussels sprouts and 1/2 head of cabbage. Cut the Brussels sprouts in half if they are big. Chop the kale by first folding each leaf in half and running a sharp knife down the edge of each "rib" to remove it, then continue cutting up kale. Roast the vegetables at 350 degrees until tender: 30 minutes for the Brussels sprouts and 20 minutes for the cauliflower, but about 50 for the butternut squash. They should be able to be pierced by a fork and a bit brown on the edges. Remove the skin from the squash and cut into bite sized square pieces. Combine chopped kale with roasted Brussels sprouts, cauliflower, and butternut squash. Drizzle with the Dijon vinaigrette and serve. To make enough for four bowls use 1 bunch of kale, 1 medium butternut squash, 4 medium beets, 1 head of broccoli, 2 cups sliced red cabbage, and 2 cups cooked brown rice. Chop the kale by first folding each leaf in half and running a sharp knife down the edge of each "rib" to remove it, then continue cutting up the kale. Roast the vegetables at 350 degrees until tender: 20 minutes for the broccoli, 30 minutes for the squash, and 50 minutes for the beets. They should be able to be pierced with a fork when done. Remove the skin from the squash and cut into bite sized square pieces. Slice the beets. Put 1/2 cup of rice in each bowl. Divide the kale, squash, beets, broccoli, and cabbage among each bowl. Drizzle with the Lemon Tahini dressing.